﻿ 【OSINT Intelligence Monitoring】,Knowlesys is your OSINT monitoring expert! Knowlesys Intelligence System (KIS) is an all-in-one web intelligence monitoring system for law enforcement agencies & intelligence agencies. KIS will help clients mine massive information from social media (Twitter, Facebook, Youtube, Insatgram ...) and traditional websites (Forum, Chat Room, News ...), and turn them into actionable intelligence by automatic analysis and manual processing. Knowlesys Intelligence System is developed based the world's leading OSINT extraction technology, with the advantages of quick identification and full coverage. It enables users to monitor the entire web and identify important information and negative public opinions in a timely manner. Knowlesys Intelligence System is an information platform that is focused on the Internet to collect, analyze, summarize and monitor massive public opinions on the web in real time and identify the key information from them and notify related people immediately for immediate responses to be made in emergency and provide direct support to the right public opinion guidance and web users' opinion collection. 8. monitoring staff can effortlessly export and prepare daily and weekly graph-supported reports on public opinions based on their own work. ￭Identify and understand public opinion concerning the relevant province/city and resolve conflicts when they just emerge. 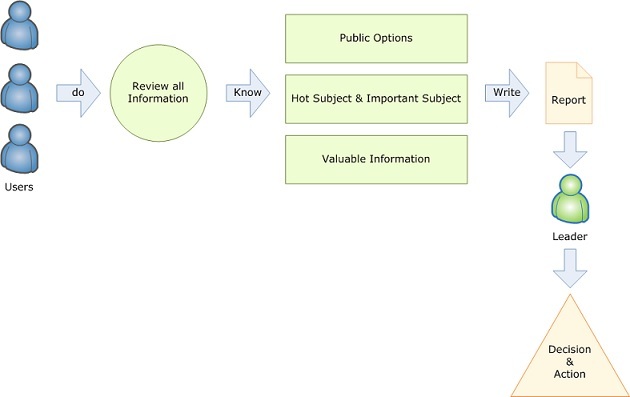 The network topology of Knowlesys Online Pubic Opinion System is shown below. It can be separately implemented in the Internet LAN and private LAN as needed. 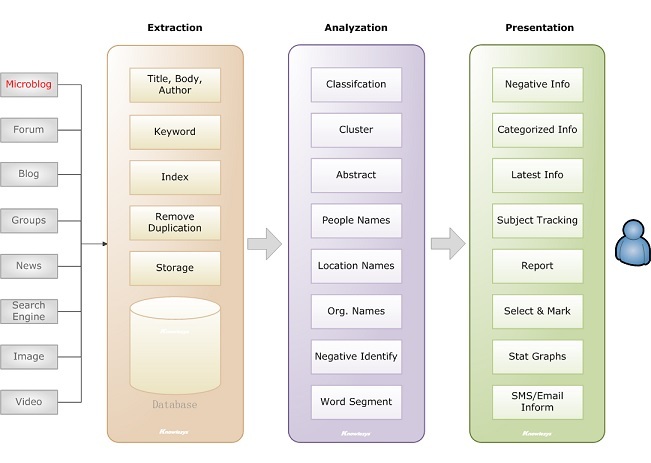 The automatic extraction sub-system can collect data on all targeted websites automatically. It can extract all news articles or topic posts, or contents of the latest topic post. It can also extract all replies to a topic post or contents of the latest reply. It can not only monitor a specified targeted websites but also monitor all website around the world without specifying target sites, or uses the two modes in combination. The user could append the targeted websites like news websites, forum websites etc. The Google, Twitter and Facebook are built-in websites. The automatic extraction sub-system can also monitor app-based chat room applications. 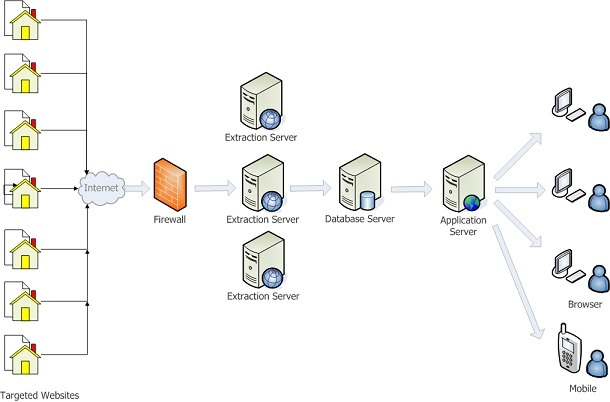 Knowlesys' web information extraction technology is leading in the world and is able to perform accurate extraction of any data on any web pages. Every day, Knowlesys provided extraction service from all kinds of websites to clients for a long time. To achieve this, an efficient and stable extraction platform is necessary. 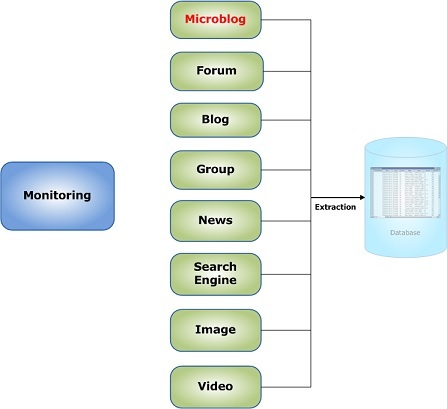 Microblogs, News, BBS, blogs, public chat rooms, search engines, message boards, applications, electronic editions of newspapers and websites can be monitored in real-time. With the built-in configuration for worldwide website monitoring, titles and texts can be automatically collected as long as the key words are typed in. allows automatic processing and save multiple languages such as Chinese, English, French, German, Japanese, Korean, Uyghur, Arabic. Article texts and titles can be directly extracted from the article-type web pages without additional configuration as well as release dates, with irrelevant contents like adverts, columns and copyright information removed automatically. 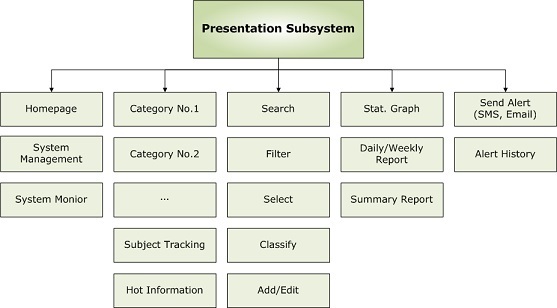 鈥?br> Do you know -- all the feature provided by our system can be integrated to deal with thousands of types of web pages or data. For the same URL, each time only the latest uncollected article contents or replies are collected; the collected contents are ignored. Automatic deduplication can be applied to reprinted articles. With the collection platform provided by the system, users can easily make visual analysis of targeted websites, configure task parameters and add them in the system. Also the user could modify, add and remove any monitoring targeted website freely. The ultra-high speed key word extraction technology developed by Knowlesys can find the number of occurrences of 10,000 key words in a 30,000 words article in no more than 6.9 ms. The contents collected can be filtered, classified, added with notes and complied for subsequent management and analysis. After key words are set, once one or more key words appear in the collected contents, the record can be sent to relevant short message receiver for unattended real-time monitoring. news-type report: Title, source, release time, content, clicks, commentator, comment content, number of comments, etc. BBS-type report: Post title, poster, posting time, content, reply content, number of replies, etc. The system is mainly applied to governments and PR departments of large and medium-sized companies. Due to the complexity of the Internet, the implementation of the Knowlesys Intelligence System requires clients' cooperation. Ensure real-time monitoring of the contents on target websites after the system is launched. Submit your requirement, or contact us now.